For many years Children’s Health Scotland has promoted play as a way to help children cope with trauma and distressing experiences and so we developed a Hospital Play Box resource which can be used to prepare children for a visit to the hospital. It contains items such as stethoscopes, doctor’s and nurse’s uniform, X-rays, etc which can help to make the child familiar with the hospital environment and reduce any anxiety they may feel. It is used in pre-school groups, schools, etc. 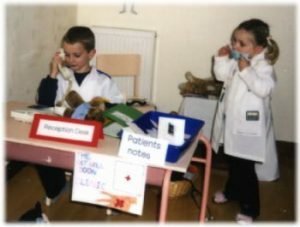 to inform children about hospitals or treatments. It aims to help children to cope with their hospital experiences or when someone close to them has been ill. It is also an effective tool to communicate with younger children and those with communication difficulties. For individual children and their families, Children’s Health Scotland also provides Hospital Play Bags which have been proved to be very useful in supporting and preparing children for planned hospital admissions or helping them to deal with hospital experiences after the have been discharged. We have Hospital Play Boxes which can be loaned on a short term basis to pre-school groups etc. and to families in their areas. If you are interested in having a Play Box please contact us on 0131 553 6553.